Michael Jordan won a record ten scoring titles in his career. In basketball, points are accumulated through free throws or field goals. The National Basketball Association's (NBA) scoring title is awarded to the player with the highest points per game average in a given season. The scoring title was originally determined by total points scored through the 1968–69 season, after which points per game was used to determine the leader instead. Players who earned scoring titles before the 1979–80 season did not record any three-point field goals because the three-point line had just been implemented in the NBA at the start of that season. To qualify for the scoring title, the player must appear in at least 70 games (out of 82) or have at least 1,400 points. These have been the entry criteria since the 1974–75 season. Wilt Chamberlain holds the all-time records for total points scored (4,029) and points per game (50.4) in a season; both records were achieved in the 1961–62 season. He also holds the rookie records for points per game when he averaged 37.6 points in the 1959–60 season. Among active players, James Harden has the highest point total (2,818) and the highest scoring average (36.1) in a season; both were achieved in the 2018–19 season. 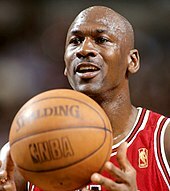 Michael Jordan has won the most scoring titles, with ten. Jordan and Chamberlain are the only players to have won seven consecutive scoring titles (this was also Chamberlain's career total). George Gervin, Allen Iverson and Durant have won four scoring titles in their career, and George Mikan, Neil Johnston and Bob McAdoo have achieved it three times. Paul Arizin, Bob Pettit, Kareem Abdul-Jabbar, Shaquille O'Neal, Tracy McGrady, Kobe Bryant, Russell Westbrook and James Harden have each won the scoring title twice. Since the 1946–47 season, five players have won both the scoring title and the NBA championship in the same season: Fulks in 1947 with the Philadelphia Warriors, Mikan from 1949 to 1950 with the Minneapolis Lakers, Abdul-Jabbar (then Lew Alcindor)[g] in 1971 with the Milwaukee Bucks, Jordan from 1991 to 1993 and from 1996 to 1998 with the Chicago Bulls, and O'Neal in 2000 with the Los Angeles Lakers. Since the introduction of the three-point field goal, O'Neal is the only scoring leader to have made no three-pointers in his winning season. Joe Fulks won the first scoring title in 1947. Wilt Chamberlain won seven consecutive scoring titles from 1960 to 1966. Jerry West won the scoring title in 1970, averaging 31.2 points per game. Kareem Abdul-Jabbar won scoring titles in 1971 and 1972. Allen Iverson won scoring titles in 1999, 2001, 2002 and 2005. Kobe Bryant won scoring titles in 2006 and 2007. LeBron James won the scoring title in 2008. Kevin Durant became the youngest scoring champion in 2010. He won another three in 2011, 2012 and 2014. Russell Westbrook won in 2015, following teammate Durant's win a year earlier, and again in 2017. Stephen Curry won the scoring title in 2016. ^ At the start of February 1st of that season. ^ The player's primary position is listed first. ^ In the 1947–48 season, Joe Fulks averaged the most points (22.1) but had only played in 43 games and totaled 949 points, the second-highest total. ^ Wilt Chamberlain holds the all-time rookie record for points per game. ^ Wilt Chamberlain holds the all-time record for total points scored and points per game in a single season. ^ In the 1967–68 season, Oscar Robertson averaged the most points (29.2) but had only played in 65 games and totaled 1,896 points, the sixth-highest total. ^ Elvin Hayes is the last rookie to lead the league in scoring average. ^ In the 1969–70 season, rookie Lew Alcindor had the highest point total (2,361) but was second in scoring average (28.8). ^ In the 1977–78 season, George Gervin defeated David Thompson for the scoring title in the closest scoring duel ever (27.21 to 27.15). Thompson scored 73 on the last day of the season and Gervin answered with 63 (Gervin also broke Thompson's record of 32 points set earlier on the same day in the first quarter by scoring a record 33 points in the second quarter). Both Thompson's and Gervin's games were losses. ^ In the 1984–85 season, rookie Michael Jordan had the highest point total (2,313) but was third in scoring average (28.2). Bernard King tied for the twelfth-highest point total (1,809) but had the highest scoring average (32.9). ^ In the 1985–86 season Alex English had the highest point total (2,414) but was third in scoring average (29.8). ^ In the 1993–94 season, David Robinson scored 71 points in the final game of the season to edge Shaquille O'Neal (29.3) for the scoring title. ^ In the 1997–98 season, Michael Jordan defeated Shaquille O'Neal for the scoring title in the third-closest race ever (28.7 to 28.3). Jordan, at 35 years and 60 days old, is the oldest scoring leader in NBA history. ^ The 1998–99 season was shortened to 50 games due to the league's lockout. The qualification of this season's scoring title is to appear in at least 43 games (out of 50) or to have at least 854 points. ^ In the lockout-shortened 1998–99 season, Shaquille O'Neal had the highest point total (1,289) but was second in scoring average (26.3). ^ In the 2000–01 season, Jerry Stackhouse had the highest point total (2,380) but was second in scoring average (29.8). ^ In the 2001–02 season, Paul Pierce had the highest point total (2,144) but was third in scoring average (26.1). ^ In the 2002–03 season, Kobe Bryant had the highest point total (2,461) but was second in scoring average (30.0). ^ In the 2003–04 season, Kevin Garnett had the highest point total (1,987) but was third in scoring average (24.2). ^ In the 2007–08 season, Kobe Bryant had the highest point total (2,323) but was second in scoring average (28.3). ^ In the 2009–10 season, Kevin Durant defeated LeBron James for the scoring title (30.1 to 29.7). Durant, at 21 years and 197 days old, is the youngest scoring leader in NBA history. ^ The 2011–12 season was shortened to 66 games due to the league's lockout. The qualification of this season's scoring title is to appear in at least 56 games (out of 66) or to have at least 1127 points. ^ In the 2011–12 season, Kevin Durant defeated Kobe Bryant for the scoring title in the second-closest scoring race ever (28.03 to 27.86). Bryant, who needed to score 38 points in the final game to win, decided to sit out. ^ In the 2012–13 season, Kevin Durant had the highest point total (2,280) but was second in scoring average (28.1). ^ In the 2014–15 season, James Harden had the highest point total (2,217) but was second in scoring average (27.4). ^ In the 2015–16 season, James Harden had the highest point total (2,376) but was second in scoring average (29.0). ^ In the 2017–18 season, LeBron James had the highest point total (2,251) but was third in scoring average (27.5). "Yearly Leaders and Records for Points Per Game". basketball-reference.com. Retrieved February 20, 2009. "Yearly Leaders and Records for Points". basketball-reference.com. Retrieved February 20, 2009. ^ a b Robbins, Liz (January 15, 2006). "Around the N.B.A. ; In the N.B.A., Scoring Titles Rarely Equal Championships". The New York Times. Retrieved February 22, 2009. ^ Brown, Clifton (February 5, 1990). "3-Pointer Adds Dimension To N.B.A". The New York Times. Retrieved February 21, 2009. ^ Haubner, Mark (January 2, 2003). "The trey is the thing in today's NBA". ESPN.com. Retrieved February 21, 2009. ^ a b c "Rate Statistic Requirements". basketball-reference.com. Retrieved March 6, 2010. ^ a b c d "Wilt Chamberlain". NBA.com. Turner Sports Interactive, Inc. Retrieved March 2, 2009. ^ a b "Michael Jordan". NBA.com. Turner Sports Interactive, Inc. Retrieved February 25, 2009. ^ Smith, Brian (April 20, 2005). "Iverson Wins Fourth Scoring Title". NBA.com. Turner Sports Interactive, Inc. Archived from the original on April 19, 2014. Retrieved February 25, 2009. ^ Carr, Janis (April 2, 2000). "Jackson aware of the score with O'Neal". The Orange County Register. p. D11. ^ a b Latzke, Jeff (April 15, 2010). "Durant Becomes NBA's Youngest Scoring Champ". ABC News Internet Ventures. Retrieved April 15, 2010. ^ "League Leaders: Points - 1946-47". NBA.com. Turner Sports Interactive, Inc. Retrieved February 20, 2009. ^ a b "Joe Fulks Stats". basketball-reference.com. Retrieved February 21, 2009. ^ "1947-48 BAA Season Summary". basketball-reference.com. Retrieved February 24, 2009. ^ "League Leaders: Points - 1947-48". NBA.com. Turner Sports Interactive, Inc. Retrieved February 20, 2009. ^ "Max Zaslofsky Stats". basketball-reference.com. Retrieved February 21, 2009. ^ "League Leaders: Points - 1948-49". NBA.com. Turner Sports Interactive, Inc. Retrieved February 20, 2009. ^ a b c "George Mikan Stats". basketball-reference.com. Retrieved February 21, 2009. ^ "League Leaders: Points - 1949-50". NBA.com. Turner Sports Interactive, Inc. Retrieved February 20, 2009. ^ "League Leaders: Points - 1950-51". NBA.com. Turner Sports Interactive, Inc. Retrieved February 20, 2009. ^ "League Leaders: Points - 1951-52". NBA.com. Turner Sports Interactive, Inc. Retrieved February 20, 2009. ^ a b "Paul Arizin Stats". basketball-reference.com. Retrieved February 21, 2009. ^ "League Leaders: Points - 1952-53". NBA.com. Turner Sports Interactive, Inc. Retrieved February 20, 2009. ^ a b c "Neil Johnston Stats". basketball-reference.com. Retrieved February 21, 2009. ^ "League Leaders: Points - 1953-54". NBA.com. Turner Sports Interactive, Inc. Retrieved February 20, 2009. ^ "League Leaders: Points - 1954-55". NBA.com. Turner Sports Interactive, Inc. Retrieved February 20, 2009. ^ "League Leaders: Points - 1955-56". NBA.com. Turner Sports Interactive, Inc. Retrieved February 20, 2009. ^ a b "Bob Pettit Stats". basketball-reference.com. Retrieved February 21, 2009. ^ "League Leaders: Points - 1956-57". NBA.com. Turner Sports Interactive, Inc. Retrieved February 20, 2009. ^ "League Leaders: Points - 1957-58". NBA.com. Turner Sports Interactive, Inc. Retrieved February 20, 2009. ^ "George Yardley Stats". basketball-reference.com. Retrieved February 21, 2009. ^ "League Leaders: Points - 1958-59". NBA.com. Turner Sports Interactive, Inc. Retrieved February 20, 2009. ^ "League Leaders: Points - 1959-60". NBA.com. Turner Sports Interactive, Inc. Retrieved February 20, 2009. ^ a b c d e f g "Wilt Chamberlain Stats". basketball-reference.com. Retrieved February 21, 2009. ^ "League Leaders: Points - 1960-61". NBA.com. Turner Sports Interactive, Inc. Retrieved February 20, 2009. ^ "League Leaders: Points - 1961-62". NBA.com. Turner Sports Interactive, Inc. Retrieved February 20, 2009. ^ "League Leaders: Points - 1962-63". NBA.com. Turner Sports Interactive, Inc. Retrieved February 20, 2009. ^ "League Leaders: Points - 1963-64". NBA.com. Turner Sports Interactive, Inc. Retrieved February 20, 2009. ^ "League Leaders: Points - 1964-65". NBA.com. Turner Sports Interactive, Inc. Retrieved February 20, 2009. ^ "League Leaders: Points - 1965-66". NBA.com. Turner Sports Interactive, Inc. Retrieved February 20, 2009. ^ "League Leaders: Points - 1966-67". NBA.com. Turner Sports Interactive, Inc. Retrieved February 20, 2009. ^ "Rick Barry Stats". basketball-reference.com. Retrieved February 21, 2009. ^ "1967-68 NBA Season Summary". basketball-reference.com. Retrieved February 24, 2009. ^ "Oscar Robertson". basketball-reference.com. Retrieved February 21, 2009. ^ "League Leaders: Points - 1967-68". NBA.com. Turner Sports Interactive, Inc. Retrieved February 20, 2009. ^ "Dave Bing Stats". basketball-reference.com. Retrieved February 21, 2009. ^ "League Leaders: Points - 1968-69". NBA.com. Turner Sports Interactive, Inc. Retrieved February 20, 2009. ^ "Elvin Hayes Stats". basketball-reference.com. Retrieved February 21, 2009. ^ "1969-70 NBA Season Summary". basketball-reference.com. Retrieved February 24, 2009. ^ "League Leaders: Points - 1969-70". NBA.com. Turner Sports Interactive, Inc. Retrieved February 20, 2009. ^ "Jerry West Stats". basketball-reference.com. Retrieved February 21, 2009. ^ "Kareem Abdul-Jabbar". NBA.com. Turner Sports Interactive, Inc. Retrieved March 8, 2009. ^ "League Leaders: Points - 1970-71". NBA.com. Turner Sports Interactive, Inc. Retrieved February 20, 2009. ^ a b "Kareem Abdul-Jabbar Stats". basketball-reference.com. Retrieved February 21, 2009. ^ "League Leaders: Points - 1971-72". NBA.com. Turner Sports Interactive, Inc. Retrieved February 20, 2009. ^ "League Leaders: Points - 1972-73". NBA.com. Turner Sports Interactive, Inc. Retrieved February 20, 2009. ^ "Nate Archibald Stats". basketball-reference.com. Retrieved February 21, 2009. ^ "League Leaders: Points - 1973-74". NBA.com. Turner Sports Interactive, Inc. Retrieved February 20, 2009. ^ a b c "Bob McAdoo Stats". basketball-reference.com. Retrieved February 21, 2009. ^ "League Leaders: Points - 1974-75". NBA.com. Turner Sports Interactive, Inc. Retrieved February 20, 2009. ^ "League Leaders: Points - 1975-76". NBA.com. Turner Sports Interactive, Inc. Retrieved February 20, 2009. ^ "League Leaders: Points - 1976-77". NBA.com. Turner Sports Interactive, Inc. Retrieved February 20, 2009. ^ "Pete Maravich Stats". basketball-reference.com. Retrieved February 21, 2009. ^ "April 9, 1978: Gervin beats Thompson in NBA scoring title duel". History Channel. A&E Television Networks. Retrieved February 22, 2009. ^ "David Thompson". NBA.com. Turner Sports Interactive. Retrieved February 22, 2009. ^ "George Gervin". NBA.com. Turner Sports Interactive, Inc. Retrieved February 22, 2009. ^ Vecsey, George (February 7, 1996). "Sports of The Times; Giant Leap For Gervin, Thompson". The New York Times. Retrieved February 22, 2009. ^ "1977-78 NBA Game Results". basketball-reference.com. Retrieved February 22, 2009. ^ "League Leaders: Points - 1977-78". NBA.com. Turner Sports Interactive, Inc. Retrieved February 20, 2009. ^ a b c d "George Gervin Stats". basketball-reference.com. Retrieved February 21, 2009. ^ "League Leaders: Points - 1978-79". NBA.com. Turner Sports Interactive, Inc. Retrieved February 20, 2009. ^ "League Leaders: Points - 1979-80". NBA.com. Turner Sports Interactive, Inc. Retrieved February 20, 2009. ^ "League Leaders: Points - 1980-81". NBA.com. Turner Sports Interactive, Inc. Retrieved February 20, 2009. ^ a b "Adrian Dantley Stats". basketball-reference.com. Retrieved February 22, 2009. ^ "League Leaders: Points - 1981-82". NBA.com. Turner Sports Interactive, Inc. Retrieved February 20, 2009. ^ "League Leaders: Points - 1982-83". NBA.com. Turner Sports Interactive, Inc. Retrieved February 20, 2009. ^ "Alex English Stats". basketball-reference.com. Retrieved February 22, 2009. ^ "League Leaders: Points - 1983-84". NBA.com. Turner Sports Interactive, Inc. Retrieved February 20, 2009. ^ "1984-85 NBA Season Summary". basketball-reference.com. Retrieved February 23, 2009. ^ "League Leaders: Points - 1984-85". NBA.com. Turner Sports Interactive, Inc. Retrieved February 20, 2009. ^ "Bernard King Stats". basketball-reference.com. Retrieved February 22, 2009. ^ "1985-86 NBA Season Summary". basketball-reference.com. Retrieved February 23, 2009. ^ "League Leaders: Points - 1985-86". NBA.com. Turner Sports Interactive, Inc. Retrieved February 20, 2009. ^ "Dominique Wilkins Stats". basketball-reference.com. Retrieved February 22, 2009. ^ "League Leaders: Points - 1986-87". NBA.com. Turner Sports Interactive, Inc. Retrieved February 20, 2009. ^ a b c d e f g h i j "Michael Jordan Stats". basketball-reference.com. Retrieved February 22, 2009. ^ "League Leaders: Points - 1987-88". NBA.com. Turner Sports Interactive, Inc. Retrieved February 20, 2009. ^ "League Leaders: Points - 1988-89". NBA.com. Turner Sports Interactive, Inc. Retrieved February 20, 2009. ^ "League Leaders: Points - 1989-90". NBA.com. Turner Sports Interactive, Inc. Retrieved February 20, 2009. ^ "League Leaders: Points - 1990-91". NBA.com. Turner Sports Interactive, Inc. Retrieved February 20, 2009. ^ "League Leaders: Points - 1991-92". NBA.com. Turner Sports Interactive, Inc. Retrieved February 20, 2009. ^ "League Leaders: Points - 1992-93". NBA.com. Turner Sports Interactive, Inc. Retrieved February 20, 2009. ^ "David Robinson". NBA.com. Turner Sports Interactive, Inc. Retrieved February 20, 2009. ^ "League Leaders: Points - 1993-94". NBA.com. Turner Sports Interactive, Inc. Retrieved February 20, 2009. ^ "David Robinson Stats". basketball-reference.com. Retrieved February 22, 2009. ^ "League Leaders: Points - 1994-9". NBA.com. Turner Sports Interactive, Inc. Retrieved February 20, 2009. ^ a b "Shaquille O'Neal Stats". basketball-reference.com. Retrieved February 22, 2009. ^ "League Leaders: Points - 1995-96". NBA.com. Turner Sports Interactive, Inc. Retrieved February 20, 2009. ^ "League Leaders: Points - 1996-97". NBA.com. Turner Sports Interactive, Inc. Retrieved February 20, 2009. ^ a b "Durant, Bryant take scoring race to wire". ESPN.com. April 26, 2012. Retrieved April 27, 2012. ^ "Michael Jordan 1997-98 game log". basketball-reference. Retrieved 24 May 2016. ^ "League Leaders: Points - 1997-98". NBA.com. Turner Sports Interactive, Inc. Retrieved February 20, 2009. ^ "1998-99 NBA Season Summary". basketball-reference.com. Retrieved February 20, 2009. ^ "League Leaders: Points - 1998-99". NBA.com. Turner Sports Interactive, Inc. Retrieved February 20, 2009. ^ a b c d "Allen Iverson Stats". basketball-reference.com. Retrieved February 22, 2009. ^ "League Leaders: Points - 1999-2000". NBA.com. Turner Sports Interactive, Inc. Retrieved February 20, 2009. ^ "2000-01 NBA Season Summary". basketball-reference.com. Retrieved February 20, 2009. ^ "League Leaders: Points - 2000-01". NBA.com. Turner Sports Interactive, Inc. Retrieved February 20, 2009. ^ "2001-02 NBA Season Summary". basketball-reference.com. Retrieved February 20, 2009. ^ "League Leaders: Points - 2001-02". NBA.com. Turner Sports Interactive, Inc. Retrieved February 20, 2009. ^ "2002-03 NBA Season Summary". basketball-reference.com. Retrieved February 20, 2009. ^ "League Leaders: Points - 2002-03". NBA.com. Turner Sports Interactive, Inc. Retrieved February 20, 2009. ^ a b "Tracy McGrady Stats". basketball-reference.com. Retrieved February 22, 2009. ^ "2003-04 NBA Season Summary". basketball-reference.com. Retrieved February 20, 2009. ^ a b "Kobe Bryant Stats". basketball-reference.com. Retrieved February 22, 2009. ^ "2007-08 NBA Season Summary". basketball-reference.com. Retrieved February 20, 2009. ^ "LeBron James Stats". basketball-reference.com. Retrieved February 22, 2009. ^ "Dwyane Wade Stats". basketball-reference.com. Retrieved April 14, 2010. ^ Beck, Howard (April 9, 2010). "Tight N.B.A. Scoring Race Comes Down to James and Durant". The New York Times. Retrieved April 30, 2010. ^ a b c d "Kevin Durant Stats". basketball-reference.com. Retrieved April 17, 2014. ^ a b McMenamin, Dave (April 26, 2012). "Kobe Bryant sits; Kevin Durant wins". ESPN.com. Retrieved April 26, 2012. ^ "2012-13 NBA Season Summary". basketball-reference.com. Retrieved April 17, 2014. ^ "Carmelo Anthony Stats". basketball-reference.com. Retrieved April 17, 2013. ^ "2014-15 NBA Season Summary". basketball-reference.com. Retrieved December 7, 2015. ^ a b "Russell Westbrook Stats". basketball-reference.com. Retrieved April 16, 2015. ^ "2015-16 NBA Season Summary LLC". basketball-reference.com. Retrieved April 14, 2016. ^ "Stephen Curry Stats". basketball-reference.com. Retrieved April 14, 2016. ^ "2017-18 NBA Season Summary LLC". basketball-reference.com. Retrieved April 12, 2018. ^ a b "James Harden Stats". basketball-reference.com. Retrieved April 12, 2018.